The Roadrunners tapped into overtime yet again Wednesday night, and for the fifth time in six games, but found a way to come out victorious in their 5-4 win over the Bakersfield Condors at Tucson Arena. Chris Mueller’s marker with just over two minutes left to play in the extra frame granted Tucson a sweep of the team’s two-game set against the Condors, the club earning a huge four points against a divisional opponent before heading into the holiday break. After a scoreless first period, the Roadrunners fell into a rut during the opening moments of the second when the Condors struck for a pair of goals in a 22 second span to take a 2-0 lead less than two minutes into the middle frame. Tucson, though, answered back with three straight goals of their own. Christian Fischer, upon exiting the penalty box after serving a tripping infraction, hopped on a puck that had rimmed out of the Roadrunners’ zone. With Bakersfield’s Laurent Brossoit way out of the net in his effort to beat Tucson’s forward to the puck, Fischer fed Ryan MacInnis a pass, who then fired a shot into the empty net. Just over three minutes later, Laurent Dauphin tipped a Kyle Wood shot that trickled past Brossoit and just over the goal-line to tie the game 2-2. 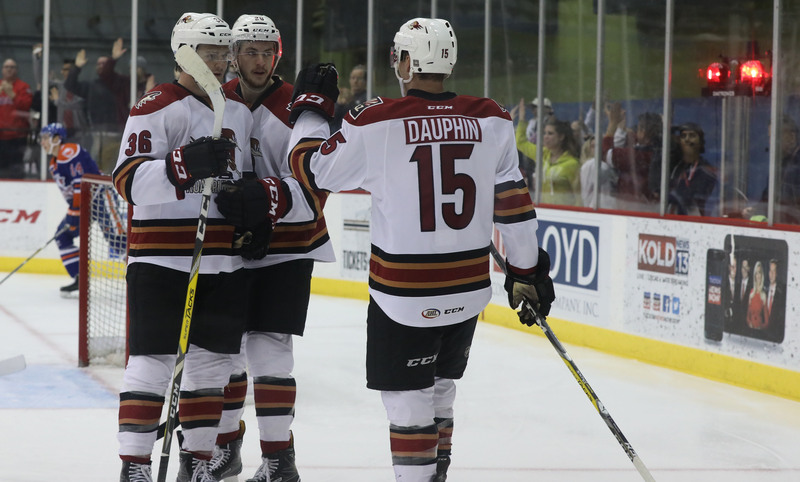 Laurent Dauphin registered his second goal of the evening with just over six minutes to play in the second when Chris Mueller found him open on the back-door with a gorgeous spin pass to give the Roadrunners their first lead of the evening. In the third, Bakersfield tacked on two more goals, including their fourth of the night with four minutes left in regulation. Down 4-3, and less than a minute after the Condors reclaimed the lead, Ryan MacInnis scored his second goal of the evening when he received a pass atop Bakersfield’s zone and fired a wrist shot that caromed off of a defenseman and into the net. 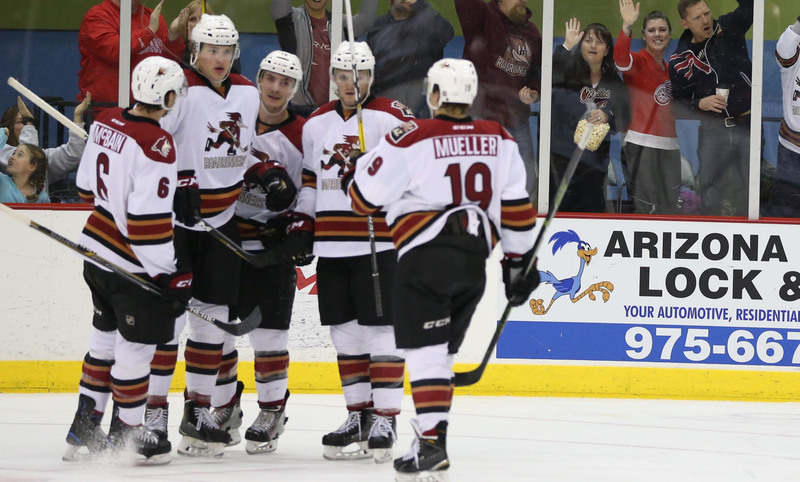 The Roadrunners entered their ninth overtime of the season; they came into the night with a 5-3 record when tied after regulation, and 4-3 in the extra period. Just past the midway point of overtime, Kyle Wood fed Chris Mueller a pass as he fled through the neutral zone with favorable positioning on Bakersfield’s defense. Mueller, upon protecting the puck from an oncoming attacker, took a quick wrist shot that beat Laurent Brossoit high to the blocker side to give Tucson a 5-4 victory. The Roadrunners enter the holiday break having won four of their previous five games, and earning points in five of their last six. Laurent Dauphin (2G, 1A) led all Roadrunners players in points scored (3), Jamie McBain in shots registered (4). Marek Langhamer made 36 saves in the win. Tucson will return to action on December 26 when they venture out on a two-game road trip, which starts against the San Diego Gulls at the Valley View Casino Center.